Someone asked me if I could extract some images from a popular Chinese mobile game. I accepted the challenge, but things were far more complicated than I expected. Original assets were encrypted with known algorithm and key. DISCLAIMER: I will not tell you details about encryption. I thought I could extract assets I needed with existing tools (e.g. Disunity) but I was proved wrong. Disunity has been refactored, and remaining work is still in progress (at least the moment I write this article). Since resource extraction has not been implemented at this moment, Disunity couldn’t be my choice. Then I turned to a tool called Unity Assets Bundle Extractor. It did a great job extracting resources I needed graphically. However, acquiring thousands of texture assets from 2000+ isolated files is not an easy job. I tried the command line support but failed (maybe I was too stupid). Luckily this toolkit provides some API and documentation. Since it was compiled with Microsoft Visual C++ 2010, I was unable to use it directly(C++ ABI constantly changes with every MSVC release). And I was too lazy to write a C wrapper for P/Invoke. But these C++ header files point to a perfect solution – parse file and implement my own UnityFS parser/reader. Special thank to the UABE project – without these generous header, I would not be able to implement my own parsing and compose this article. UnityFS was a new asset bundle format introduced in Unity 5. I am not a Unity3D developer, and I absolutely didn’t know why Unity introduce a new bundle format. But anyway, let’s analyze it. UnityFS is just bundle of several Unity assets. Each asset contains a collection of serialized Unity objects (e.g. 2D texture, text resources, scene objects, etc.). You have to parse asset files in order to extract what you need. There’s bunch of documentation about this. Look into the old Disunity source code for some idea. (Flags & 0x3F) is compression mode. 0 means no compression, 1 means LZMA and 2/3 means LZ4/LZ4HC. (Flags & 0x40) says whether the bundle has directory info. (Flags & 0x80) says whether the block and directory list is at the end of this bundle file. C# provides a good BinaryReader that makes things a bit easy. But it can be improved for better Null-terminated String and Big Endian support. Be careful with endianness. Unity utilizes both Big Endian and Little Endian in a single file and personally I didn’t get this. For the sake of convenience, I extended the original BinaryReader for these support. Length of each data type matters – but that’s a basic stuff for CS students. 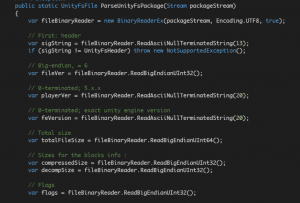 UnityFS uses optional block-based compression for streaming (you can read a specific bundle without downloading the whole file). Both LZMA and LZ4* (LZ4Hc, etc.) are supported. The Unity’s proprietary parser and Disunity respects this design. But I just wanted these bundle files, so I decided to read all blocks at once and decompress into a single memory stream. Decompressed size should match what you get. If not, something must happened. You can implement your own block-based reader – but my time budget didn’t allow me to do this. There we go…block and file information! Following a unknown 16 bytes block, there’s a Big-Endian UInt32 value represents block count in a single package. Each block information contains a Big-Endian UInt32 decompressed size, a Big-Endian UInt32 compressed size and a flag that we might not interested in. Then a BE UInt32 value represents file count in a single package. Each file information contains file offset we need(BE UInt64), the decompressed size(BE UInt64), a BE UInt32 flag and a Null-Terminated string of file name. With sufficient information we retrieved, we were able to extract raw asset files from a UnityFS bundle. Then what you need is search the Internet for ideas of extracting objects(text resources, 2D texture, etc.) from Unity assets. Good luck on exploring! 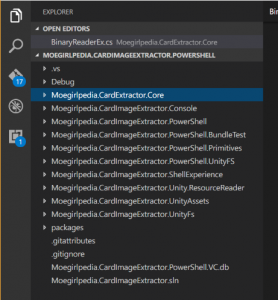 In this article, we discussed structure and parsing of UnityFS resource bundle file. For more information about UnityFS and Unity asset files, please research these projects I mentioned in this article. Effects such as DropShadowEffect, BlurEffect were removed from Windows Runtime XAML. In order to achieve some goals, I need to write something like these. Luckily Direct2D provides many useful effects for us, including Gaussian Blur, which is the effect I want. At first I tried SharpDX, it worked well on Intel platform devices, but not ARM-based devices. To make matters worse, SharpDX‘s performance was not so good as I thought. 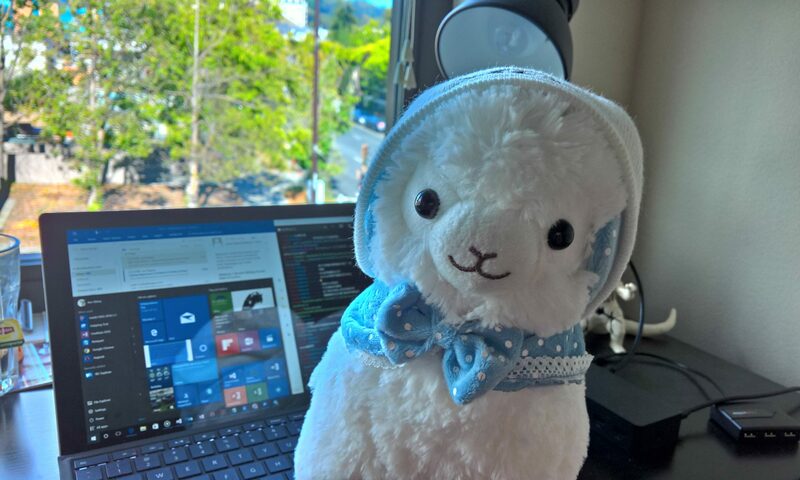 So I had to write a C++/CX Windows Runtime Component and use it in my own Windows Runtime XAML project. To use Direct2D, I need to create device resources first. Create the Direct3D 11 API device object, and then get the Direct2D device object. Then receive the bitmap and create WIC object. Finally get things ready and draw, and generate output file. Note: Set D2D1_GAUSSIANBLUR_PROP_BORDER_MODE to D2D1_BORDER_MODE_HARD, you will get the iOS 7-like blur style. // than the API default. It is required for compatibility with Direct2D. // If the project is in a debug build, enable debugging via SDK Layers. // description. All applications are assumed to support 9.1 unless otherwise stated. // Create the Direct3D 11 API device object. nullptr, // Specify nullptr to use the default adapter. creationFlags, // Set debug and Direct2D compatibility flags. featureLevels, // List of feature levels this app can support. D3D11_SDK_VERSION, // Always set this to D3D11_SDK_VERSION for Windows Store apps. &m_d3dDevice, // Returns the Direct3D device created. // Get the Direct3D 11.1 API device. // Create the Direct2D device object and a corresponding context. /// Internal method referred from Bing. /// Convert IBuffer to IStream. /// Render image but not get the final image. /// REMEMBER call DataInitialize method first. // Create a Bitmap Source Effect. // Set the BitmapSource Property to the BitmapSource generated earlier. // Create the Gaussian Blur Effect. // Set the input to recieve the bitmap from the BitmapSourceEffect. // Set the blur amount. // Draw the scaled and blurred image. // is lost. It will be handled during the next call to Present. /// Initializes all device resources and the image. /// You need to call this method before doing other things. // Now we have the image source and we can decode it. /// Get the final image. /// You can call this method before calling RenderImage, but you will get the original image. // Render the bitmap use WIC. // Convert it to stream. And don’t forget these input file: dxgi, dwrite, d2d1, d3d11, windowscodec, etc.